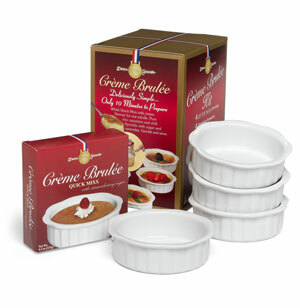 Don't wait until your next visit to a fancy restaurant for delicious gourmet desserts; make them right at home with your new Gourmet Creme Brulee Set. Featuring traditional flavor and a smooth, creamy texture this classic dessert is sure to delight your friends and family. Wonderful way to make a quick, gourmet dessert. Can be made on the stovetop or microwave. Only takes 10 minutes to prepare. Contains egg, soy, and dairy.